The first Tasman Cup was a battle of the expats as a two-car team of Brabhams led by Australian Jack Brabham faced a two-car team of Coopers led by Kiwi Bruce McLaren. McLaren won three of the four New Zealand races but when the teams moved to Australia for the second half of the series, Brabham won the first three of those. It sounds like a Hollywood set up for a thrilling finish but the points system denied that, as Brabham was unable to improve his score and McLaren emerged as champion. The most successful of the locals was John Youl with six finishes in the top 5, a fabulous performance in a three-year-old car. Bib Stillwell only competed in three Australian races and twice pipped Youl, including a remarkable second place in the Australian Grand Prix at Sandown Park. 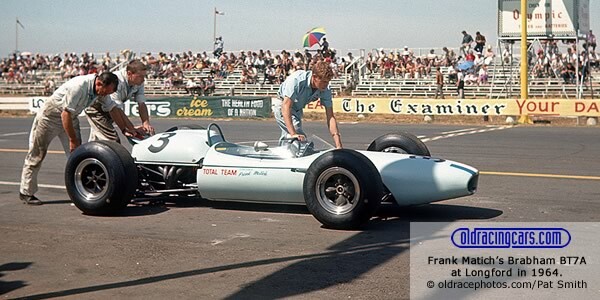 Frank Matich was very quick in his new Team Total Brabham BT7A, taking pole position at Warwick Farm and leading until his suspension broke, but he retired five times in total and finished only once: third place at Longford ahead of both Stillwell and Youl. 16 Feb 1964 > Warwick Farm "100"
23 Feb 1964 > Lakeside "99"